Pearl, MS -- The Biloxi Shuckers rallied to tie the game in the ninth inning and won in extras over the Mississippi Braves on Tuesday afternoon at Trustmark Park, 6-3. The loss dropped the M-Braves to 1.5 games behind the Shuckers in the second-half Southern League South Division race with six games remaining in the regular season. Tuesday was the regular season finale at Trustmark Park with the Braves finishing 36-33 in the friendly confines. Travis Demeritte put the M-Braves (34-28, 63-69) on top for the first time in the bottom of the sixth inning by blasting his 17th home run of the season. The two-run shot traveled 436 feet to left-center and landed below the scoreboard on the berm. Tyler Neslony walked with two outs to set up the homer. 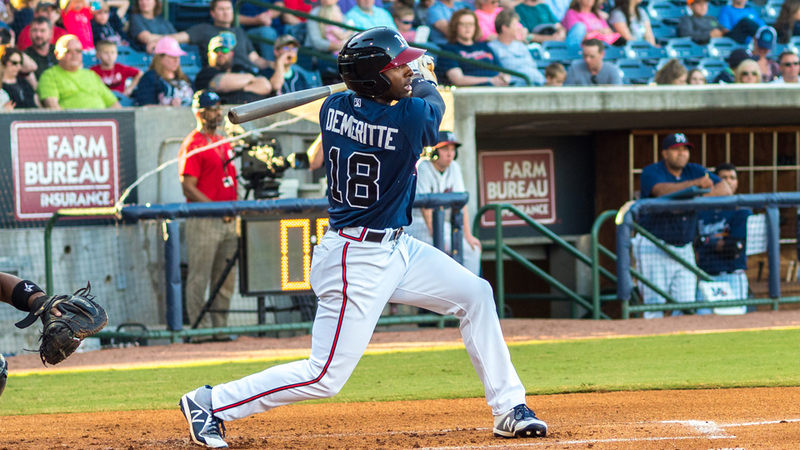 Demeritte has five home runs and a .900 OPS in the month of August. Biloxi (37-28, 78-57) got on the scoreboard first with a solo home run by Troy Stokes Jr. in the first inning. M-Braves starter Enderson Franco logged his second straight quality start and sixth on the season, but came away with a no-decision. In 6.1 innings, the 25-year-old struck out seven walked just one, surrendering the lone run on five hits. Left-hander Thomas Burrows pitched 1.2 innings scoreless behind Franco to maintain the 2-1 advantage heading into the ninth. Burrows has not conceded a run over his last six outings and 10.0 innings pitched. Jason Hursh secured the first out of the top of the ninth inning before Biloxi put the next four batters on base. Trent Grisham started the rally with a single followed by back-to-back walks to Tyler Heineman and Luis Aviles Jr. Gabriel Noriega hit a bases-loaded single scoring Grisham and the game was knotted at two. Rex Brothers (L, 3-1) entered out of the bullpen and induced a pop out and a groundout to keep the game tied. In the 10th inning, Biloxi's bonus runner was Corey Ray who promptly stole third base to put the go-ahead run on the doorstep. The M-Braves walked Keston Hiura prior to a pop out by Stokes for the first out of the inning. Hiura advanced to second on indifference, then the Braves decided to walk Weston Wilson intentionally. Grisham, who scored the tying run, brought home two runs to give Biloxi back a lead at 4-2 with a bases-loaded single. Heineman then produced another on a sacrifice fly to increase their lead to 5-2. Aviles singled home the sixth run against Brothers with a bloop single to right and it was 6-2. The M-Braves did not go down without a fight on Tuesday afternoon against Southern League saves leader Nate Griep. Connor Lien singled home the bonus runner, Alejandro Salazar , with a single to center, trimming Biloxi's lead to 6-3. Jonathan Morales reached with a single to bring the tying run to the plate with no outs. Greip got pinch-hitter, Carlos Martinez to fly out and then struck out Demeritte for the second out. Cristian Pache reached on a walk to load the bases for Luis Valenzuela. Valenzuela sent a deep fly ball to left that was tracked down by Stokes against the wall to end the game dramatically. The M-Braves concluded their 24-game season series with the Shuckers at 11-13 and trail in the all-time series 45-44. Biloxi reliever Jeff Ames (W, 4-1) earned the win on Tuesday. Mississippi will now travel to Jacksonville to enjoy a day off on Wednesday before opening a six-game series in five days against the Jumbo Shrimp beginning on Thursday. The series will open with a doubleheader, followed by a single game on Friday, another doubleheader on Saturday, off day on Sunday and the series and season finale on Monday afternoon. Pensacola will play their final series at Tennessee and Biloxi will play host to Birmingham. First pitch of game one on Thursday is set for 4:05 pm CT with coverage beginning at 4:00 pm on 103.0 WYAB, TuneIn Radio, and MiLB.TV. LHP Michael Mader will make the start in game one and RHP Elian Leyva to follow in game two. For more information, call the M-Braves Front Office at 601.932.8788 or 888-BRAVES4, or visit www.mississippibraves.com.